With 2016 coming to a close, GG thought we might want to see just how things are shaking out in Oklahoma, home of the great induced earthquake experiment. And there is something for everybody, depending on how you want to look at it. Monthly averaged daily injection volumes of Arbuckle disposal wells in the Area of Interest for Triggered Seismicity, from Oklahoma Corporation Commission, Oil and Gas Division. (December decline probably because of incomplete reporting). Seismic moment release in Oklahoma in 2016, derived from USGS catalog. The 9/3/2016 M5.8 Pawnee, Oklahoma earthquake put a big damper on any celebration of a decrease in seismicity. The overall moment release of 7.8 x 1024 dyne cm is the largest single year moment release in Oklahoma history. As we noted before, this isn’t unexpected: the Rocky Mountain Arsenal sequence in the 1960s produced its largest quakes after the injection ended. So we enter 2017 on a note of caution. If you bought earthquake insurance in Oklahoma, don’t let it lapse just yet. You might get shaken a bit less often, but when you do get a quake, it might still be pretty big. P.S. : there are a couple of nice visualizations out there. Tulsa World put together an interactive map a year ago showing how produced water injection was varying over time and by county. The Oklahoma state government has an interactive figure with recent earthquakes and disposal well locations. A news story that should chill all our spines given the President-Elect’s love of Twitter came along recently: A Pakistani minister was threatening nuclear war…on Twitter…over fake news. This is a reminder that diplomacy often requires time and patience. An old example is illustrative. In 1858 a transatlantic telegraph cable was laid, and briefly the Old World and the New World could share messages instantly. The cable, though, failed within a couple of months (Wikipedia claims a failure of insulation due to improper voltages; the successor cables were cut in 1929 by turbidity currents triggered by an earthquake). Communications reverted to shipborne papers that took a week or more to cross the pond. In November of 1861, the USS San Jacinto stopped the British mail vessel RMS Trent outside of Cuba and took into custody two Confederate envoys and their secretaries, claiming them as contraband, while allowing the Trent to continue. In the following days, as news of this reached the U.S., reaction from both the public and those in government was jubilation. The only problem was that this action was illegal under international law, and Britain’s response was equally strong but of opposite sense. The North was trying to prevent European recognition of the South; Britain’s response indicated that the British might not only recognize the South but enter the war on its behalf. But communications were slow, the American ambassador could offer no insight into what had actually happened when word first reached London, and the American government only learned of the official British protest a month and half after the U.S. became aware of the seizure. In the delays as governments awaited firmer news, cooler heads started to prevail. In the U.S., they pointed out the flawed capture of the envoys as well as the risk of opening a second war, a war with one of the North’s chief suppliers of military arms. Rather than risk such a war and realizing their own culpability in the affair, the U.S. government released the two envoys to the British. What would have happened had communication been as rapid in 1861 as it was briefly in 1858? A real risk would have been for each government to have committed itself to its more radical initial instincts; war between the United States and Great Britain could easily have erupted. Having time to reconsider their positions–for the U.S. to recognize they had been in the wrong, and for the British to recognize that the U.S. might not have authorized the illegal seizure–allowed for compromise. War can be the result of misunderstanding as much as a true conflict over goals or resources. Most diplomats recognize this, having the lessons of the gruesome conflicts of the past century to educate them. But we seem to be losing the ability to wait and think, so it is worth remembering examples like this where some reflection produced a better result than a quick response would have. With the ongoing plague of fabricated news and a new effort to pretend that real news you don’t like is fake, GG would like to encourage all to support non-partisan organizations that actually verify the facts of different claims made by politicians and government officials. (Support can be monetary for some, simply bookmarking, subscribing or linking for others). Once we lose our grip on reality, the ability of the public to make any kind of an informed choice is gone. Here are a few GG has found helpful because they will usually guide you to the most primary sources for each topic. Sometimes they will parse language differently than you might, but the detailed summaries give you enough information to decide if you agree with their summary judgement. Factcheck.org, which also has a specific part (Scicheck.org) dedicated to fact checking scientific claims, they are also quite transparent about their funding sources. FactCheck.org is a project of the Annenberg Public Policy Center of the University of Pennsylvania. Politifact.com is the home of the “Pants on Fire” evaluation of some claims. This site is also distinguished by having separate pages for individual states (with contributions from local fact checking sources), pages keeping track of campaign promises, and pages on individual politicians. A rather unusual organization with a diverse set of partnerships and financial support, they don’t take individual donations, but you can follow them or subscribe to their findings. Snopes.com is a more broad-based site that has a focus more on urban legends and internet rumors as well as recent news stories and so is the place to go when you hear from some relative that Elvis is alive, that Nigerian royalty needs their help, or that they have to pass on some email to prevent their computer from being hacked. Snopes is ad-supported and unaffiliated with any political organization. (As an aside, Norton.com has generally been a clearinghouse for new flavors of cyberattacks like phishing, trojan horses, and various viruses. So sometimes this is where you look when some relative wants to respond to a strange email. The site is supported by the sale of their anti-virus software, presumably). 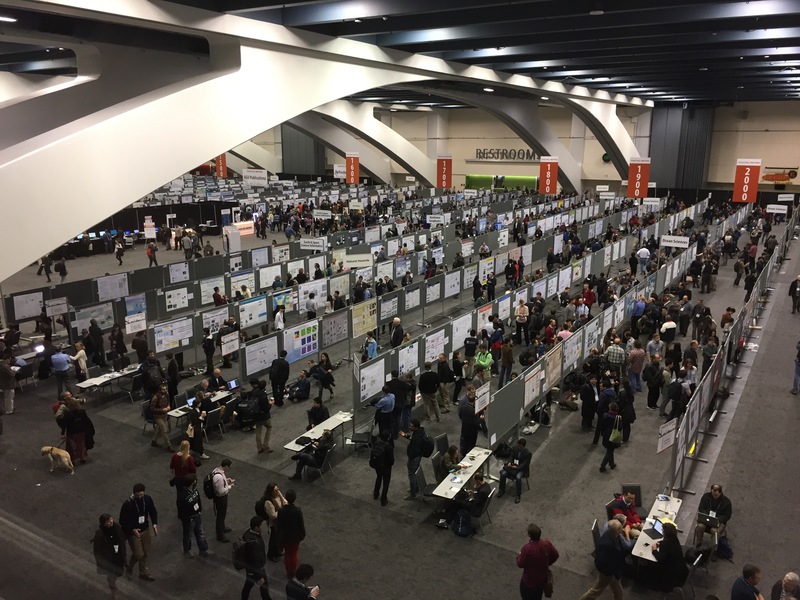 Retraction watch is focused tightly on problems in the scientific literature itself; sometimes their findings reflect issues of concern beyond just the scientific community. The site does seek financial contributions while continuing to keep its work public. Washington Post fact checker is the home of the multiple Pinocchio summary evaluation. Based in the nation’s capital, this column/website focuses on political statements at the national level. Access to stories can be limited by a paywall, so you can support by subscribing (many papers, like the Denver Post, actually offer an online subscription as a benefit). Many newspapers and television now support some fact-checker type position; some of these are probably very good, some others might well be partisan hacks. What you want to see is a trail that leads you back to the most primary sources. Of course ideally journalism in general should be built upon facts that are verified. Can Geology Overcome Climate Denialism? There’s also the question of why conservatives found the material more persuasive: did it tap into their desire to preserve the past, as Baldwin and Lammers suggest? Or could it be because the past-focused materials showed evidence about what has already happened, which is more persuasive than predictions about what may happen? In a sense, the crux of the matter is twofold: showing that something is happening, and showing what the cause of that something is. This paper is addressing the first point, and heavens only knows we have lots and lots of examples now to point at, from the decline in the size of the North Polar ice cap to the decline in the volume of the Greenland ice sheet to the change in the ratio of record high to record low temperatures to the changes in hardiness zones for gardeners to changing dates when frozen lakes and rivers thaw out to the increasing incidence of non-storm related flooding of low-lying areas. In point of fact, many conservative communities have notices some of these impacts and are working to ameliorate the problem. But this level of recognition might only result in attempts to deal with a particular symptom and not the underlying disease. So that second level, seeing the connection between the things you can see changing and the underlying cause, is also important. The climate community has leaned heavily on their climate models to make the case, but these are not compelling for many in the public, in part because of confusion between the use of retrospective models and predictive models and in part because this then seems like predicting an uncertain future. GG has harped on this before; an alternative is to look at what has happened in the geologic past. And here we can find that times when the earth was warmer were times when carbon dioxide (and/or methane) was present at higher levels. We even have an example of a moment when atmospheric carbon levels rose at a geologically rapid rate: the Paleocene-Eocene thermal maximum (PETM). We find the ocean becoming more acidic in cores of seep sea sediments, shifts in the forest trees on land, and an extinction event that defines the end of the Paleocene. We also learn that many of the environmental impacts grow more severe the shorter the time period when the carbon is added to the atmosphere: the PETM was triggered by a carbon release over a few to a couple thousand years, with many (probably most) scientists who have worked on this inclined toward the few thousand year end. Higher temperatures were achieved more gradually in the early Eocene climatic optimum, but that event was not associated with such a pronounced extinction record. Gosh, will write something more science-y soon, but the political stuff just keeps coming. Eyebrows rose last week as a member of Trump’s transition team, Anthony Scaramucci, said in contending that scientific consensus about climate change doesn’t mean that it is the correct conclusion: “There was an overwhelming science that the Earth was flat, and there was an overwhelming science that we were the center of the world. We get a lot of things wrong in the scientific community.” We, kimo sabe? Could the Trump camp please find somebody literate enough with science that the denials of climate change could be accompanied by slightly more relevant comparisons? Maybe you could make the case with continental drift vs. geosynclinal theory a century ago, though even that didn’t get such a strong consensus. But no, comparing climate science to a flat earth is what we get. Why doubly ignorant? The first is the contention there was “overwhelming science” for a flat Earth or geocentrism. This would imply that somebody sat down and hypothesized that the Earth was flat and the center of the universe and then set about collecting evidence–and that that evidence was overwhelming. Er, no. Certainly not the case for a flat Earth and not a very accurate description of geocentrism (which required multiple modifications to survive later observations). The problem with geocentrism really had to do with the unquestioned basic assumption–nobody was considering the hypothesis that the earth was not at the center of the universe; this is not an issue with climate change, where the null hypotheses (climate isn’t changing, human carbon emissions have no effect on climate) have been debated and tested and found to violate observation. The second is perhaps unfair, but by bringing in the flat Earth, Scaramucci implies that people thought the Earth was flat for a long time, which is a fun story for making Columbus a visionary, but is utterly without factual basis [in fact, Columbus differed from others in his estimate of the size of the Earth, and he was wrong but lucky in that there was another continent in the way]. Simple observations like seeing ships’ masts over the horizon before the ship became visible or the shape of the Earth’s shadow on the Moon in a lunar eclipse showed people long, long ago that the earth wasn’t flat. A flat Earth was never supported by science of any sort; it was a simplification people used. In fact, the Greeks knew the Earth was spherical and even measured its size pretty accurately. 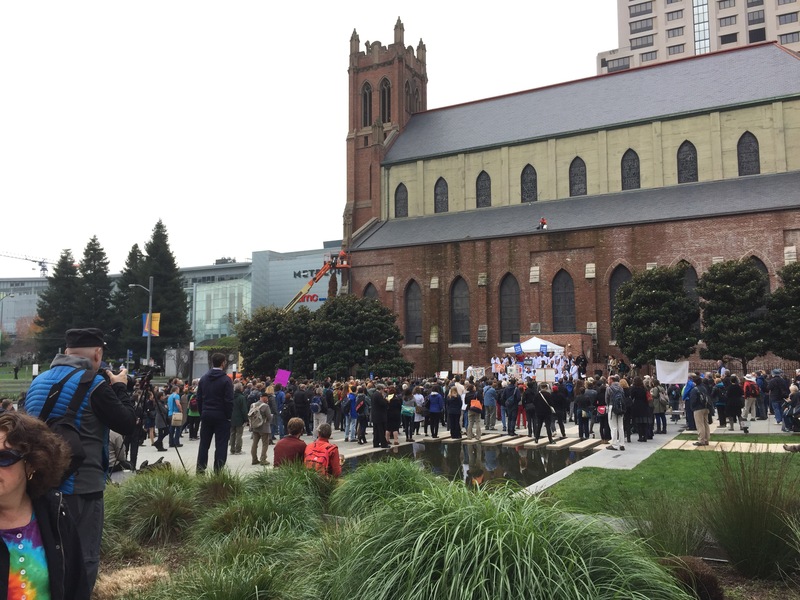 This smaller get together during lunch was to protest the denigration of science. Billed “Stand up for Science,” you might think it a bit of a failure given the nearby mobs in line at Noodles and Company and in the nearby food courts. But look, these are professionals who, on average, are more retiring than most folks. (GG wonders how often medical doctors gather outside an AMA meeting to protest some health care issues). So it is significant that a few hundred were willing to stand for over an hour and listen to exhortations to fight against a denial of scientific findings. Americans can be of two minds sometimes. They might not believe in evolution but accept clinical treatments based on evolution. They might not believe humans cause climate change but support clean energy. So if scientists start taking to the streets to demand to be heard, what might happen? Will practical America be dominant, or belief America? Support science or demonize it? This could further politicize science-perhaps in general or just climate science. Will colleagues in chemistry and physics and biology stand with climate scientists? If so, the scientific community might move as a whole into politics. If not, the popular perception might be that climate science isn’t real science. Most scientists would rather not be a special interest group beholden to one party. Scientists have played Cassandra before; usually the response is more dismissive than confrontational. Yet moves by the incoming administration to identify those who have worked on climate change combined with moves by the House Committee on Science, Space and Technology to examine NSF reviews suggests suppression and discrediting are the action items now. Scientists are noticing. How will the scientific community react? How will the public react? PS. 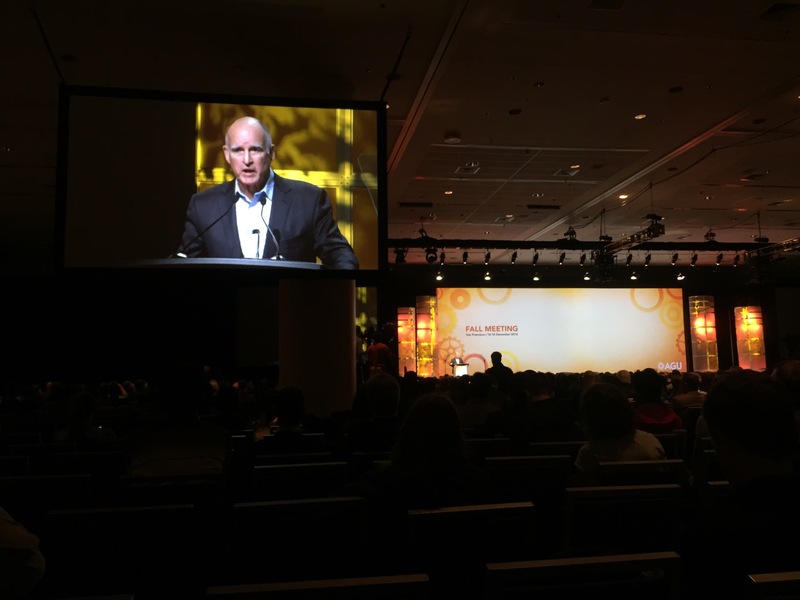 A rather late addition to the AGU schedule was a talk by California Governor Jerry Brown; this underscores the shift of climate science from science into policy. Brown more or less was cheerleading, noting California’s dedication to reducing carbon emissions and the numerous collaborations the state has with other entities. He promised that California has lots of lawyers and so attacks on scientists would be fought, as would attempts to interfere with national labs and satellite monitoring of climate. He offered his feeling that, based on his 40 years in politics, that truth will win out and he encouraged the audience to continue to pursue truth and share it with the world. All you have to lose, he offered, are grants and tenure; all politicians have to lose are elections. Basically, don’t despair, science has powerful friends and the truth as well. When asked at the end what he would tell an aspiring scientist thinking of shifting away from climate studies, he said there is no better place to be than in climate, as it just got interesting.